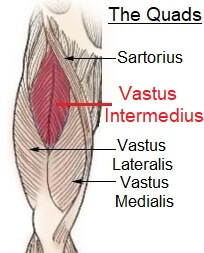 Vastus Intermedius runs down the front of the thigh, in-between vastus medialis and vastus lateralis, and underneath rectus femoris – it is the deepest of the quadriceps. It arises from fleshy fibres from the upper two-thirds of the anterior and lateral surfaces of the shaft of the femur. The fibres run downwards forming a broad tendon on the more superficial aspect (known as a superficial aponeurosis) which attaches to the deep surface of rectus femoris, vastus lateralis and vastus medialis forming the deep part of the quadriceps tendon. The quadriceps tendon attaches to the upper surface of the patella (kneecap), encompasses the patella and attaches to the tibial tuberosity via the ligamentum patellae. 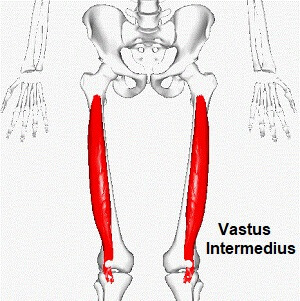 Vastus Intermedialis is difficult to separate from vastus lateralis in the middle of the thigh and is frequently continuous with vastus medialis lower down, virtually impossible to separate. Some of the deeper fibres of vastus intermedius attach to the superior aspect of the suprapatellar bursa which lies underneath the muscle. These fibres are referred to as the articularis genus, and arise from a small area on the lower third of the anterior femoral shaft, passing downwards to the bursa. The main function of the articularis genus is to stop the synovial membrane from becoming trapped and interfering with normal knee movement. Vastus Intermedius is the hardest of the quadriceps muscles to stretch due to its position as the deepest and most central muscle. The other quadriceps muscles can be stretched by adding some bias to the stretch – rectus femoris by extending the hip and vastus lateralis and medialis by adding a sideways element to the stretch, usually through massage - vastus intermedialis is too deep to manipulate.